By Terry Dunn on Oct. 19, 2016 at 6 a.m. I've been excited to get my hands on the ARRMA Nero 6S monster truck ever since it was released a few months ago. I've been excited to get my hands on the ARRMA Nero 6S monster truck ($700) ever since it was released a few months ago. 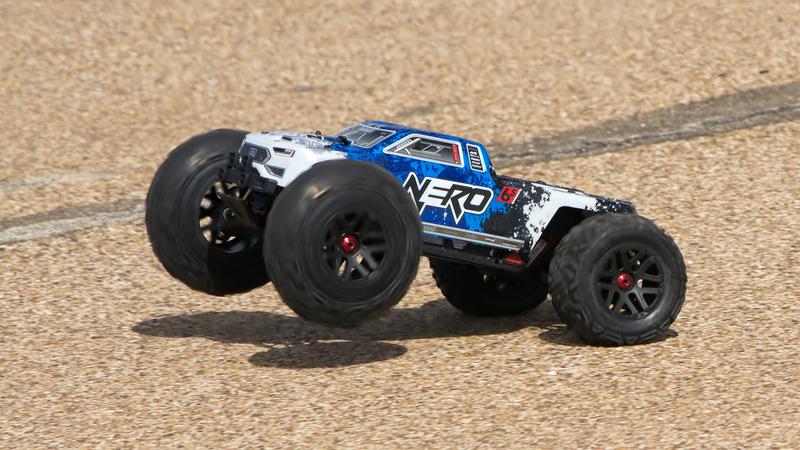 First of all, being a 1/8-scale vehicle, the Nero is bigger than any of my previous RC ground-pounders. With a large brushless motor and 6-cell LiPo battery, the Nero also promised to be much more powerful than anything I'd ever driven. Size and power are certainly alluring, but the real reason I was intrigued by the Nero had to do with a feature called Diff Brain (a version of the Nero without Diff Brain is also available). This package provides the ability to lock and unlock the Nero's differentials on the fly. 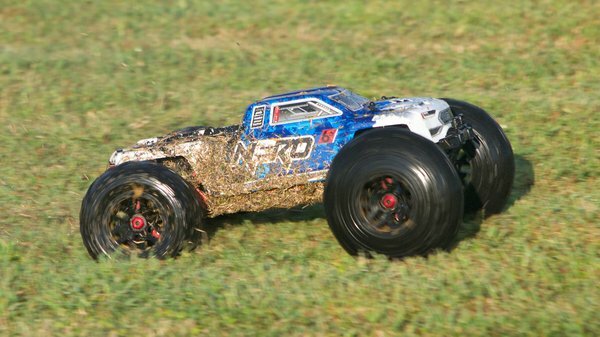 I've never seen such a feature on any RC vehicle before. I had no idea if this was a useful capability or just marketing hype. I couldn't wait to test it myself. The Nero is pre-built and comes equipped with everything except batteries. You'll need two 3-cell LiPo batteries of about 5000mAh capacity. I used a pair of Duratrax Onyx 3S-5400mAh packs. You'll also want to make sure that your batteries have a high discharge capability, since the Nero will pull a lot of amps under hard acceleration. The 50C discharge rating for these Onyx units seems to be more than adequate. The difference between a common RC truck in 1/10-scale and one in 1/8-scale doesn't seem like it would be that significant. After all, the physical dimensions aren't that far apart. I soon found that assumption to be false. The Nero has more than double the mass and power of most of my 1/10-scale rides. 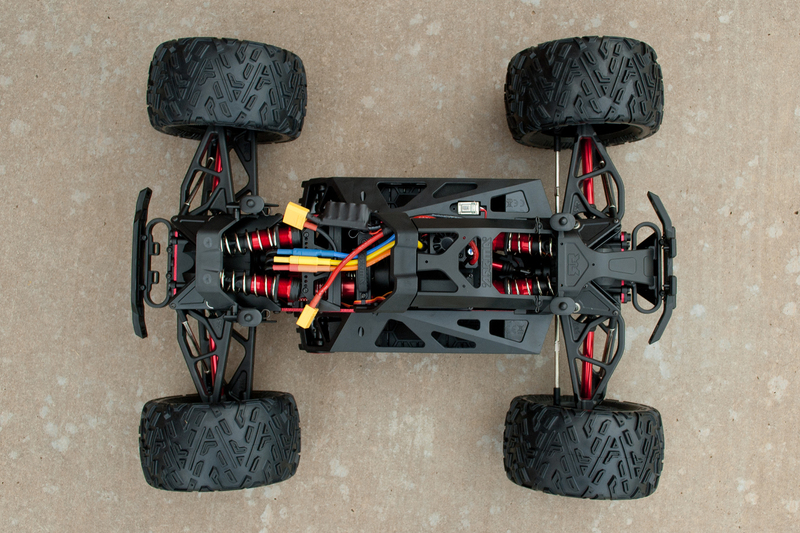 Moving up to a 1/8-scale vehicle brings a whole new level of performance and significantly beefier components. You'll also need to be prepared for increased maintenance overhead. 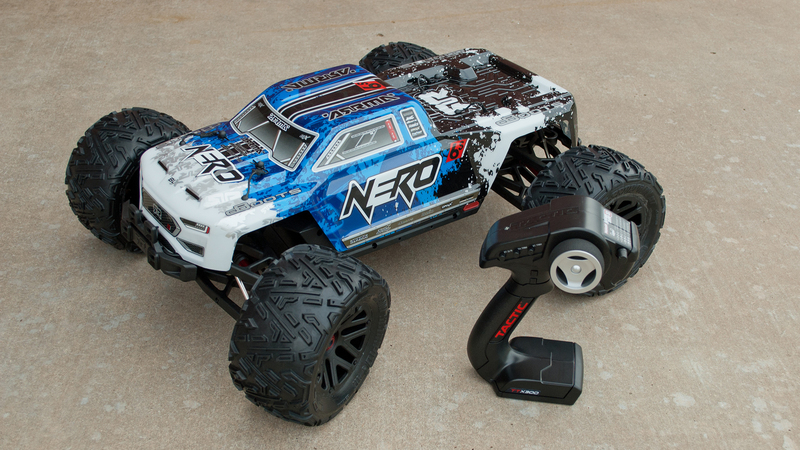 The ARRMA Nero 6S is a completely prebuilt model that includes a 3-channel radio system. Two red-anodized aluminum plates comprise the backbone of the Nero's chassis. All of the other chassis components are made of black nylon. The suspension is damped by four large, oil-filled shocks. The shocks are in a horizontal orientation with bellcranks and pushrods connecting them to the suspension arms. The included radio is a 2.4GHz Tactic TTX300 3-channel unit. The pistol-grip transmitter is straightforward in its layout and function. The only obvious departure from the norm is the 4-position knob forward of the steering wheel that controls the Diff Brain function. All of the onboard electronics are waterproof, so you don't have to worry about driving through puddles. Steering is handled by a large, metal-gear servo. The 150-amp speed control has a built-in fan that helps to keep it cool. 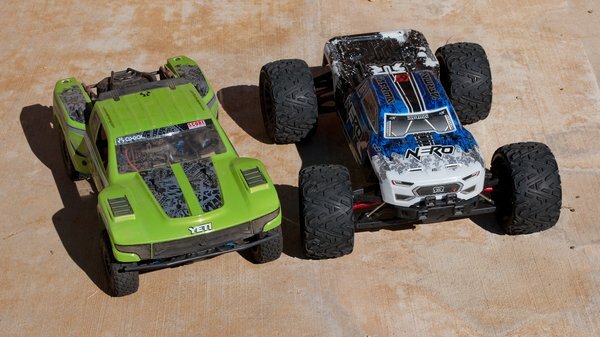 With the Nero next to my Axial Yeti SCORE, you can see that the size difference between 1/10-scale and 1/8-scale vehicles isn't that significant. However, the uptick in weight, power, and maintenance should not be overlooked. Compartments on either side of the chassis hold the batteries. Push-button latches release doors on the bottom side that swing open to provide access. You can insert and remove the batteries with the truck body in place, but you will have to remove it to plug or unplug the power connectors. Speaking of the body, it is pre-painted at the factory. I really liked that the body clips are attached with short lanyards to prevent them from getting lost. The only prep work to be done before driving the Nero is to charge the batteries. 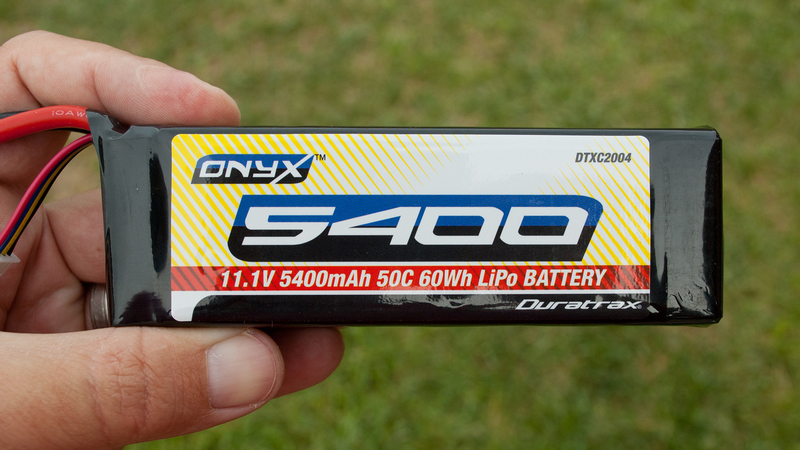 I was able to charge both batteries at once using a dual-output charger, the Duratrax Onyx 245. It can utilize AC or DC input and charges NiCad and NiMH cells in addition to Lithium battery types. The Nero uses high-current XT-90 power connectors, so you'll need to be sure that you have these connectors on your batteries and charger. The kit includes two XT-90 connectors for your batteries. The Nero's powerful brushless motor requires two 3-cell Lipo batteries. I'm using a pair of these Duratrax Onyx units with good success. Differentials are simple yet essential elements for most wheeled vehicles (RC and full-scale). As a car goes around a turn, the inside tires take a shorter path than the outside tires. A differential is what allows two wheels on the same axle to rotate at different speeds so that neither tire is slipping on the road surface during a turn. There are two basic types of differentials, gear and limited-slip. Gear differentials offer relatively little resistance to the independent movement of each tire. The end result is that the bulk of the engine's power is directed to the tire with the least amount of traction at any given time. Limited-slip differentials provide more resistance to individual movement and distribute the engine's power more equally. Each type of differential has its advantages and drawbacks. If you need to know more about differentials, Marisa Tomei explains it all in My Cousin Vinny. The Diff Brain feature allows each of the Nero's three gear differentials to be locked from the transmitter. This makes the truck more adaptable to numerous applications. The Nero has three gear-type differentials; one for the front wheels, one for the rear, and one in between. A servo integrated into each diff allows it to be locked or unlocked from the transmitter. A locked differential is just like a solid axle, where both connected wheels spin at the exact same speed. The Nero's four locking options are: All unlocked (Blast mode), center locked (Wheelie mode), center and rear locked (Drift mode), and all locked (Climb mode). Each of those settings changes the performance of the Nero and allows it to be adapted for use on different terrains and in varied applications. Most of my RC cars get their first run on the quiet residential street where I live. The Nero was no exception, at least not initially. Not knowing what to expect from this beast, I took it easy at first. My driving gradually became more aggressive as I got used to the truck. At one point, I was heading down the road at a moderate speed and punched the throttle. The Nero promptly performed a wheelie so strong that it flipped over backwards and slid to an undignified inverted stop in the middle of the street. That was my first real glimpse at just how powerful this truck is. I soon decided that the Nero needed more elbow room than my street could safely provide. My next destination with the Nero was my local RC flying field. Here, I had access to a large paved surface, short grass (with abundant puddles), and dirt. I felt much more at ease setting the Nero loose here. I was blown away by how fast this truck could tear across any of the surfaces I tried. It didn't seem to care what was beneath the tires. The Nero is a fast machine on any surface. An interesting thing I noted about the Nero is how the wide tires will balloon to a much larger diameter in certain situations. This is especially evident under heavy acceleration when the truck squats on the rear end and the front end gets light. The front tires swell outward to cartoonish dimensions. I passed around the transmitter to several of my friends at the field and let them have a go with the Nero. All of them were amazed with the truck's speed and ability to pop wheelies seemingly at will. Well, almost everyone was amazed. One guy was just somewhat impressed. I soon discovered that he owns large, gas-powered RC cars, so he was already quite familiar with this level of performance (and beyond). Even so, he commented about how powerful the Nero's brushless motor is. The large, soft tires on the Nero will balloon outward under heavy acceleration. Most of my initial outings with the Nero had the Diff Brain in the default Blast setting with all three differentials unlocked. I then began experimenting with the other modes to see how they affect the trucks performance. I can say without question that each Diff Brain setting gives the Nero a different feel. There are way too many variables involved to make generalized statements about the effects of each mode--but there are definitely noticeable effects! I find that I use Blast and Drift modes the majority of the time that I drive they Nero. They seem to give the most predictable handling characteristics, especially on paved surfaces. The truck tends to have a little bit of oversteer when coasting and understeer when you keep some power in during a turn. The huge sticky tires do well on most surfaces. So don't expect to do any real drifting in Drift mode unless you swap the tires with others that have much less traction. With that said, you could rename Drift mode to "Rooster Tail mode" and it would be very accurate. Head for some dirt and be heavy on the throttle. Climb mode has the most obvious effect on performance. In this setting, the truck becomes somewhat reluctant to turn. Of course, it will turn. You just need to give it more room than usual. Fair warning: driving in Climb mode across your lawn is a good way to rip up all of the sod! I haven't yet tackled any steep terrain to test out the intended use of Climb mode. I look forward to that opportunity. The truck's run time is obviously a direct relationship to how heavy-handed you are with the throttle. Softer terrain will also cut into your times. My run times have varied anywhere from 10 to 20 minutes. I haven't held anything back while testing the Nero. It has been flipped, rolled, bounced, and otherwise abused on just about every run. Weighing more than thirteen pounds, there is a lot of kinetic energy involved when this truck gets moving (and crashing). The Nero has suffered the slings and arrows of my driving with no ill effects in almost every instance…almost. On one occasion, I unwittingly drove the Nero at top speed into a raised slab of concrete (who put that there?!). This concrete was slightly higher than the Nero's ground clearance. The impact caused a sickening thud and sent the truck cartwheeling into the air. When the Nero settled back to the ground, its awkward, uneven stance indicated that things were not as they should be. The Nero's chassis is composed primarily of molded nylon components. It is tough (but not indestructible) and repairs are affordable. I surveyed the damage and was surprised to find very little that needed to be fixed. The front nylon skid plate had absorbed most of the impact and was permanently deformed. Also, one of the nylon steering linkages had sheared. After investing less than $25 in new parts and about an hour of repair time, the truck was back in tip-top shape. In addition to repairs, you'll also need to keep up with a few periodic maintenance chores on the Nero. Some items, such as the suspension pivot balls, should be looked over every 10 or so runs. Other items are on a 20-run or 50-run cycle. These tasks should not be overlooked if you intend to keep the truck performing reliably. The necessary steps for all of the maintenance functions are clearly illustrated in the Nero's manual. 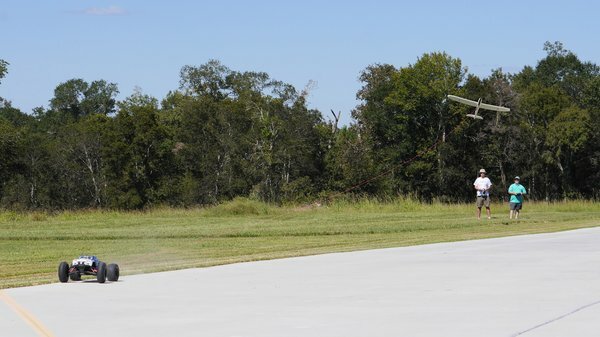 One day I was hit with the idea that the Nero could be used to launch one of my RC gliders. The airplane that I had in mind was the Multiplex Easy Glider, a 71"-wingspan foamy that flies well and is super tough. The Easy Glider has a hook in the bottom of the fuselage that is intended for launching the airplane with a hi-start (aka really long rubber band). The hi-start has a metal ring that fits over the hook. As the glider reaches the apex of its climb, the ring and hook naturally separate. I figured that I could use the same passive attachment system with the Nero. I used about 125' of mason's twine and tied a metal split ring (stolen from an old key chain) to one end. The other end was attached to the rear bumper of the Nero. My original concept had the tow line routed through a pulley staked to the ground so that the climbing glider would not lift the rear end of the truck. My buddies talked me into bypassing the pulley for our first attempts. For the maiden tow, we staged the Nero on a paved runway while the Easy Glider started off from nearby grass. I drove the Nero, while my friend, Lee Ray, piloted the glider. At the word "go", I eased into the throttle. The glider slid across the grass and was quickly airborne with the nose pointed skyward. I soon had the truck tearing down the runway at full power while the glider clawed its way into the air. The higher the glider climbed, the looser the Nero's handling became. By the time the tow line fell free of the glider's hook, I was having real trouble keeping the Nero pointed in the right direction. Despite my steering troubles, the launch worked quite well. The glider was able to get about 100 feet of altitude and Lee made a full circuit of the field before landing at his feet. It wasn't until we were setting up for the next tow that we noticed how slick the concrete runway really was. It was as smooth as a roller rink. So we moved the truck to the adjacent grass for subsequent launches. With the added traction provided by that change, I was thereafter able to steer the Nero with no problem for the entirety of each tow sprint. Along with another buddy, Fitz Walker, Lee and I performed numerous launches throughout the day. The only hiccup we encountered was when the Nero driver would accidentally direct the truck back over the towline after a launch was completed. The line would inevitably get caught by the tires and wrapped around the nearest suspension arm. It didn't cause any damage, but required us to unwrap the coiled line from the truck. We later switched to a 225' towline and we were able to get much higher launches. At one point, I was able to catch a thermal and keep the Easy Glider aloft for several minutes. 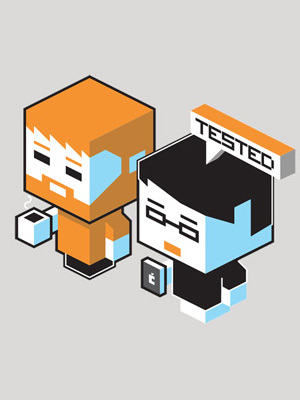 While chatting about our experiences at the end of the day, I learned that Lee only used about half throttle when he was driving the Nero for launches. Yet, his launches were just as good as those when Fitz or I drove (at full throttle). So it appears that there is plenty of headroom available to attain even better climbs. Our initial success with the Nero and Easy Glider has piqued my interest in this launch method. I plan to do some experimenting that will include a variety of my RC cars and gliders. Stay tuned. 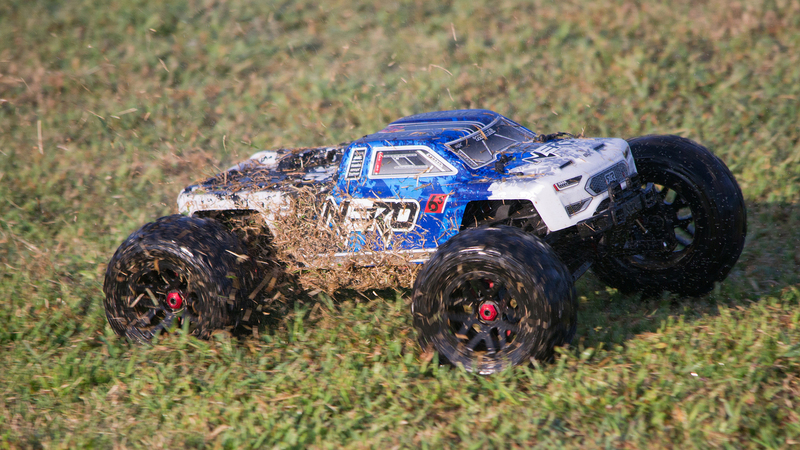 The Nero 6S has opened my eyes to a whole new level of performance and power in electric RC trucks. This turnkey package is capable of reaching ridiculous speeds across all types of terrain. Frankly, it's a little scary at times. 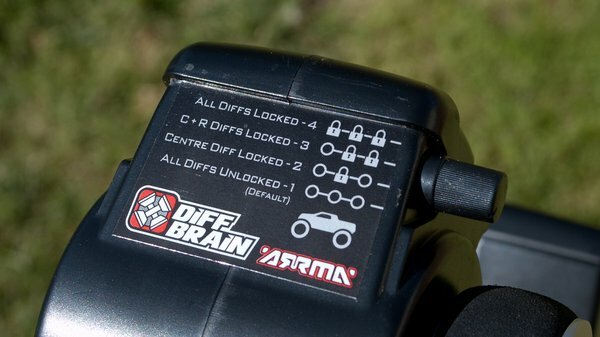 The Diff Brain option makes the truck even more adaptable to different situations. It's definitely worth the $100 upcharge. While the Nero is really fun and exciting to drive, ownership of such a machine is not something to be taken lightly. It needs adequate space to be driven. The Nero also demands an owner who is willing to devote the necessary effort and cash to keep it well-maintained. If you're ready to make those commitments, the Nero will reward you with toughness, power, and versatility.